Bu çalışmanın amacı; antrenmanlı sporcularda çeviklik özelliği ve ağırlıklı squat sıçrama egzersizi esnasındaki hız ve güç değerleri arasındaki ilişkinin araştırılmasıdır. Bu amaç doğrultusunda, farklı branşlarda mücadele eden (kick boks, karate, taekwondo, güreş ve futbol) 62 sporcu (yaş: 20,9± 1,92 yıl; boy: 178,1 ± 4,83 cm; kilo: 71,2 ± 7,37 kg) çalışmaya gönüllü olarak katıldı. Katılımcılara illinois çeviklik testi ve vücut ağırlıklarının %40’ına karşılık gelen bir dış yük kullanılarak ağırlıklı squat sıçrama egzersizi yaptırıldı ve ortalama hız (OH), ortalama itme hızı (OİH), zirve hız (ZH), ortalama güç (OG), ortalama itme gücü (OİG) ve zirve güç (ZG) değerleri elde edildi. Verilerin analizinde; tanımlayıcı istatistik, Shapiro-Wilk testi ve pearson korelasyon analizi kullanıldı. Analiz sonuçlarına göre; katılımcıların çeviklik testindeki ortalama koşu zamanları 15,8 (± ,51 sn) olarak elde edildi. Ağırlıklı squat sıçrama egzersizi esnasındaki hız değerleri OH için 1.38 (± ,08 m/sn), OİH için 1.55 (± ,11 m/sn) ve ZH için 2.58 (± ,17 m/sn) olarak elde edilirken; güç değerleri ise OG için 389,2 (± 51,6 W), OİG için 642,6 (± 118,1 W) ve ZG için 1119,4 (± 184,6 W) olarak elde edildi. Çeviklik testindeki koşu zamanları ile OH (r = - ,516; p<0.01), OİH (r = - ,434; p<0.01), ZH (r = - ,461; p<0.01), OG (r = - ,518; p<0.01), OİG (r = - ,487; p<0.01) ve ZG (r = - ,514; p<0.01) arasında yüksek düzeyde, negatif ve istatistiksel olarak anlamlı bir ilişki olduğu elde edildi. Buna göre; ağırlıklı squat sıçrama egzersizindeki hız ve güç değerleri arttıkça, çeviklik testindeki koşu zamanları azalmaktadır. Sonuç olarak, ağırlıklı squat sıçrama egzersizi esnasındaki hız ve güç değerlerinin çeviklik performansını olumlu yönde etkilediği ileri sürülebilir. The purpose of this study was to investigate the relationship between velocity and power values during loaded-squat jump exercise and agility characteristic in trained athletes. In accordance with this purpose, 62 athletes (age: 20,9 ± 1,92 years; height: 178,1 ± 4,83 cm; weight: 71,2 ± 7,37 kg) who competed in the different sport brances (kick box, karate, taekwondo, wrestling and football) participated voluntarily in this study. Subjects were performed to illinois agility test and loaded-squat jump exercise by using an external load corresponding to 40 % of their body weight and velocity and power parameters were obtained as mean velocity (MV), mean propulsive velocity (MPV) and peak velocity (PV), mean power (MP), mean propulsive power (MPP) and peak power (PP). In the analysis of data; descriptive statistics, Shapiro wilk test and pearson correlation anaylsis were used. According to the analysis results; average running times of participates in agility test was obtained as 15,8 (± ,51 sec). While velocity values during loaded squat jump exercise were obtained as 1.38 (± ,08 m/s) for MV, 1.55 (± ,11 m/s) for MPV, 2.58 (± ,17 m/s) for PV; power values were obtained as 389,2 (± 51,6 W ) for MP, 642,6 (± 118,1 W) for MPP, and 1119,4 (± 184,6 W) for PP. In addition it was determined that there was a high-level, negative and statistically significant difference between MV (r = - ,516; p<0.01), MPV (r = - ,434; p<0.01), PV (r = - ,461; p<0.01), MP (r = - ,518; p<0.01), MPP (r = - ,487; p<0.01) and PP (r = - ,514; p<0.01) with running times in the agility test. Accordingly, as velocity and power values during loaded squat jump exercise increases, running times in agility test decreases. As a result, it can be suggested that velocity and power values during loaded-squat jump exercise have a positive effects on agility performance. Baker, D., Nance, S., & Moore, M. (2001). The load that maximizes the average mechanical power output during jump squats in power-trained athletes. Journal of Strength and Conditioning Research, 15(1), 92-97. Bartlett, R. (2007). Introduction to sports biomechanics: Analysing human movement patterns (2nd edition). Oxon: Routledge. Cormie, P., McCaulley, G.O., Triplett, N.T., & McBride, J.M. (2007). Optimal loadig for maximal power output during lower body resistance exercises, Medicine and Science in Sports and Exercise, 39(2): 340-349. Cronin, J.B., & Sleivert, G. (2005). Challenges in understanding the influence of maximal power training on improving athletic Performance. Sports Medicine, 35(3), 213-234. Gambetta, V. (1996). How to develop sport specific speed. Sports Coach, 19(3), 22-24. Hoffman, J.R, Epstein, S., Einbinder, M., & Weinstein, Y. (2000). A comparison between the wingate anaerobic power test to both vertical jump and line drill tests in basketball players. Journal of Strength and Conditioning Research, 14(3), 261-264. Kraemer, J.W., & Vinger, L.J. (2007). Muscle anatomy, In Brown EL. (Eds.). Strength training: National strength and conditioning association (pp. 3-28). United States: Human Kinetics. Loturco, I., D’Angelo, R.A., Fernandes, V., Gil, S., Kobal, R., Cal Abad, C.C., Kitamura, K., & Nakamura, F.Y. (2015). Relationship between sprint ability and loaded / unloaded jump tests in elite sprinters. Journal of Strength and Conditioning Research, 29(3), 758-764. Mackenzie, B. (2005). 101 Performance Evaluation Tests. London: Electric Word Plc. McBride, J.M., Triplett-McBride, T., Davie, A., & Newton, R.U. (2002). The effect of heavy- vs. lightload jump squats on the development of strength, power, and speed. Journal of Strength and Conditioning Research, 16(1); 75-82. Newton, R.U., & Kraemer, J.W. (1994). Developing explosive muscular power: Implications for a mixed methods training strategy. Strength and Conditioning Association Journal, 16(5), 20-31. Parsons, L.S., & Jones, M. (1998). Development of speed, agility and quickness for tennis athletes. Strength and Conditioning Journal, 20(3); 14-19. Ratamess, N. (2012). ACSM'S foundations of strength training and conditioning. Chine: Lippincott Williams & Wilkins. Sanchez-Medina L, Perez CE, & Gonzales-Badillo JJ. (2010). Importance of the propulsive phase in strength assessment. International Journal of Sports Medicine, 31(2), 123-129. Sanchez-Medina, L., Gonzales-Badillo, J.J., Perez, C.E., & Pallares, J.G. (2014). Velocity and power - load relationship of the bench pull vs. bench press exercises. International Journal of Sports Medicine, 35(3), 209-216. Schultz, F.A., Cavazzoni, P., Carnevale, R.V., Abad, C.C., Kobal, R., Pereira, L.A., & Loturco, I. (2015). Speed and power predictors of change of direction ability in elite snow athletes. Journal of Human Sport & Exercise, 10(4); 847-856. Sheppard, J.M., & Young, W.B. (2006). Agility literature review: classifications, training and testing. Journal of Sports Science, 24(9), 919-932. Sophia, N., McGuigan, M.R., & Newton, R.U. (2010). Relationship between strength, power, speed, and change of direction performance of female softball players. Journal of Strength and Conditioning Research, 24(4), 885-895. Stone, M.H., Sanborn, K., & O'Bryant, H.S. (2003). Maximum strength-power performance relationships in college throwers. Journal of Strength and Conditioning Research, 17(4), 739-745. Twist, P.W., & Benicky, D. (1995). Conditioning lateral movements for multisport athletes. Practical strength and quickness drills. Strength and Conditioning Journal, 17(5), 43-5. Young, W.B., Mcdowell, H.M., & Scarlett, B.J. (2001). Specificity of sprint and agility training methods. Journal of Strength and Conditioning Research, 15(3), 315-319. Young, W., James, R. & Montgomery, I. (2002). Is muscle power related to running with changes of direction. Journal of Sports Medicine and Physical Fitness, 42(3); 282-288. Young, W.B., & Farrow, D. (2006). A review of agility: Practical applications for strength and conditioning. National Strength and Conditioning Association, 28(5), 24-29. Zatsiorsky, V.M. (1998). Kinematics of human motion. United States: Human Kinetics. ISNAD CAN, İbrahim , ÖZMEN, Mustafa , BAYRAKDAROĞLU, Serdar . "Antrenmanlı Sporcularda Çeviklik ve Ağırlıklı Squat Sıçrama Egzersizi Esnasındaki Hız ve Güç Değerleri Arasındaki İlişki". 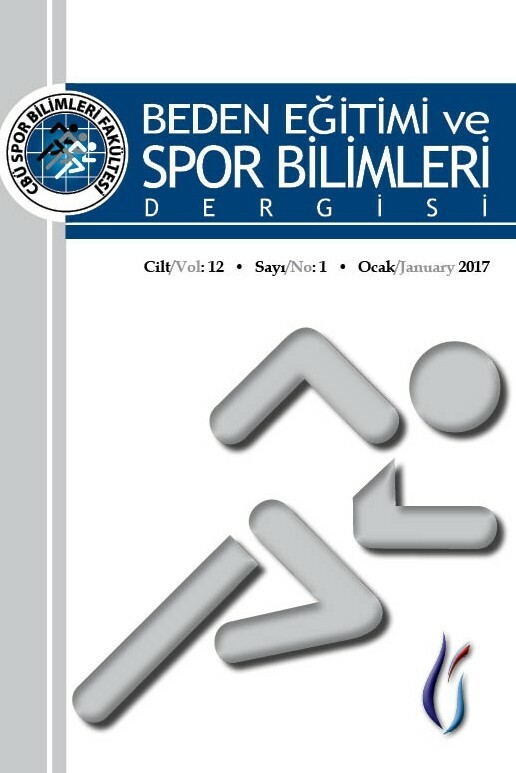 CBÜ Beden Eğitimi ve Spor Bilimleri Dergisi 12 / 2 (December 2017): 136-144.